Dwight King has been skating opposite Justin Williams thus far in training camp and didn’t raise an eyebrow when learning about his right wing’s supreme possession metrics. On Thursday night, it was King who had the puck on his stick at a critical juncture (well, critical for an early preseason game), snapping Tyler Toffoli’s cross-slot feed past John Gibson to tie the game against the Ducks at two. 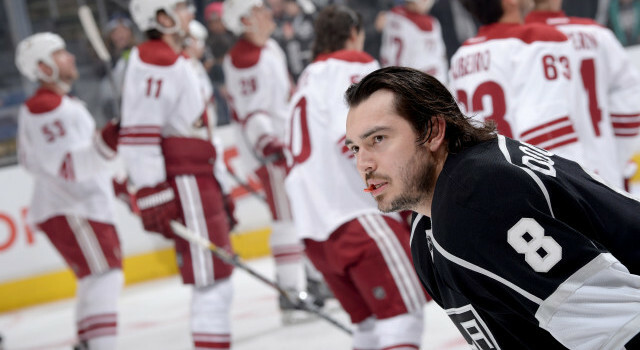 King eventually scored the shootout-deciding goal in Los Angeles’ 4-3 win. He wasn’t surprised by the pass received from Toffoli, who is emerging as one of the Pacific Division’s bright young snipers. King is looking to continue to add more to his own game, and said that his efforts during the preseason involve his play along the boards, where he’s able to use his 6-foot-4, 230 pound frame. The wall play has been a strength of this Kings team, which has been one of the most dominant possession teams and perimeter battle-winning teams in the National Hockey League over the last five years. And King has been a very effective possession player for Los Angeles. Last year, his Corsi-for percentage ranked fifth on the team at 58.6%, meaning that 58.6% of all shot attempts while he was on the ice were directed at the attacking net. His possession stats relative to the rest of the players on a possession-dominant team were well in the black. It creates an interesting “third line” for the Kings. Williams, one of the league’s top possession forwards, had a Corsi-for relative rating of +6.57%, indicating he’s one of the most dynamic possession-sustaining players on the league’s top possession team from a year ago. 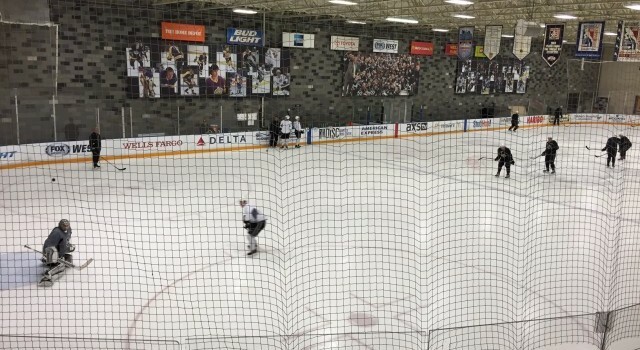 Mike Richards, who has centered Williams and King in training camp practices and in last Monday’s game in Arizona, hasn’t been as effective of a possession-type forward in Los Angeles as he was in Philadelphia but should improve given the natural progression to the mean and more playing time alongside other strong play-driving forwards. Are such concepts – possession stats, analytics, “fancy stats” – discussed amongst coaches and the team? There’s no quantifiable way to determine the comfort level he has with his linemates. But if there was, it’d be growing. Much of the proof will be in the attacking zone time they’re trying to generate. No, I think I’m probably slated in our eight-to-10 hole in our shootout rotation. You won’t see me too much. It was very similar to my first one. A simple mindset – try to fool them with the release, and it went in. I think everybody does. You come in wanting to improve on your last season. You look at number-wise and obviously team-wise, that ranks a little more in the importance level, but you always have a number in the back of your head that you shoot for to stay hungry. Not on our team. If they do, I’m sure they’re just kind of in the same boat as me where they’re just trying to figure out exactly what the numbers mean. He definitely analyzes the game in a lot of different areas, so it wouldn’t surprise me. It’s been a wild ride so far. Obviously I’ve been fortunate enough to be drafted into this organization where they’ve developed a lot of good players and acquired a lot of good players, like you’ve said. I’m just fortunate to just kind of take it for what it is right now. It’s pretty much the same team again this year, so that’s the exciting part of being here.